Prairie View principal Donna Wiktorowski shared the theme song for Prairie View this year, Prairie View: A Good Place to Grow, and welcomed the chance to have it included in the new GCS series on Growing within Goshen Community Schools. You can see a video of the students singing the song below, but directly below this are the words to the song. Welcome to school. We’re glad that you’re here. We’re looking ahead to a fabulous year. Prairie View’s a good place to grow. Prairie View: A good place to grow. Prairie View: Good people to know. There’s no other place that I’d rather go. Those are the values that we all live by. Prairie View’s a good place to be. This is the way to keep our dreams alive. We all work together. We’re one big team. Prairie View’s a good place to dream! 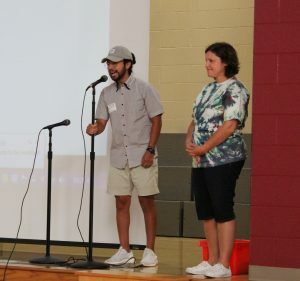 As part of their all-school celebration today, a former Prairie View student, Adrian de la Vega, visited to talk to them about an IB attribute; being a risk-taker. Adrian encouraged the students to be risk-takers at a young age because “if you take risks when you are young, it will be even easier when you get older. You will learn more, and it is an important thing to do”. Adrian is currently a college student and a proud Prairie View alum, from Mrs. Wiktorowski’s 4th grade class! Thank you, Prairie View, for sharing your song and for being a great place to GROW!